Easter is one of the most popular holidays in Germany. After a long, cold German winter and the temporary relief of Karneval, Easter welcomes the eagerly anticipated spring season. Americans and other Westerners might be surprised how many traditions come directly from German culture. Like Christmas, there are many traditions celebrated around the world that root from Germany. If you spend the Easter in Germany, memorize these two words: Frohe Ostern (pronunciation: FRO-Huh OS-tern) or "Happy Easter"! This is uttered everywhere from casual interactions at the grocery store to greetings among friends and family. Twigs and branches or a specially designed Easter tree are displayed in the home for Easter, dripping with colorfully decorated eggs. Branches are on sale at every florist in the city, including stops on the U and S-Bahn (subway and rapid transit), and only cost 1.50 to 5 euros depending on the type of foliage. Eggs at all levels of quality can also be found. From neon plastic to traditional Sorbian eggs. If you are up for travel, visit the impressive Easter tree in Saalfeld. Thousands of eggs adorn a tree in the garden of Volker Kraft and an estimated 8,000 people come to gaze in wonder. Eggs are a prominent feature in Easter celebrations as symbols of new life. In Germany, eggs are often still hand-blown and delicately decorated. Eggs were traditionally dyed with natural materials like tea, roots, and spices. That said, modern times have intruded and you can also buy egg-dying kits or bright, pre-dyed eggs in the store. If you want to see traditional egg decoration, visit a Sorbian Easter Egg Market in eastern Germany. Here, people in traditional dress meticulously hand-blown and paint eggs for sale in an array of designs. Next to the Easter egg, the rabbit is the most popular Easter icon. The Easter bunny, symbolizing fertility, was first mentioned in German writings in the 16th century. The bunny was then imported to America by Pennsylvania Dutch settlers, which was called the oschter haws (Easter hare). Around 1800, the first edible Easter bunnies were made in Germany. And just like real bunnies, they have multiplied. There is always an occasion to eat chocolates in Germany, but Easter really kicks this into overdrive. Among the many treats on offer, kinder uberraschung (kinder surprise) is a favorite and an integral German Easter tradition—despite the company's origin in Italy. Though not legal in the USA (although you can easily find their other offerings like tic tacs), you will find them everywhere in Germany. 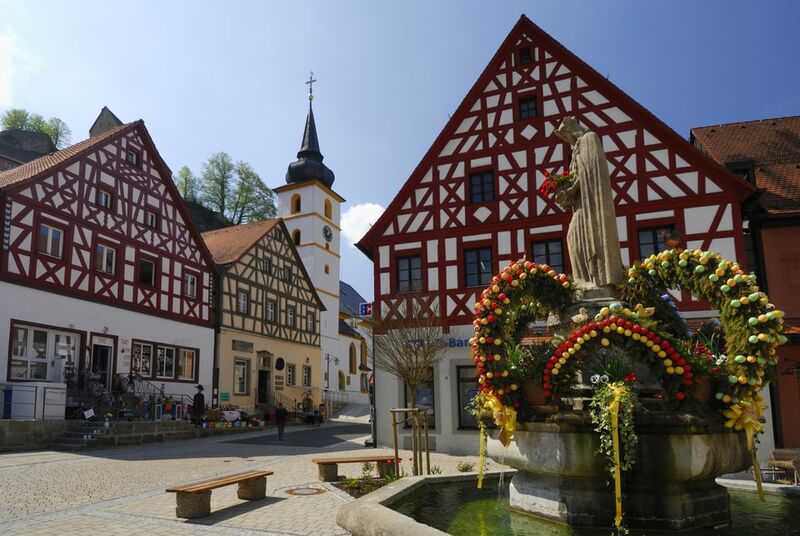 Osterbrunnen (Easter fountains) are another colorful celebration of Easter in Germany. Public fountains are draped in arches of evergreen and colorful Easter eggs. They usually appear in Catholic-observing southern Germany, like in Bieberbach. Their fountains have won Guinness World records and draw over 30,000 tourists around Easter. Dates for Easter in 2019 are April 19th - April 22nd. The Easter weekend in Germany begins with a quiet Good Friday (Karfreitag). Many families eat fish as their traditional Good Friday lunch before enjoying a weekend together. Easter Saturday is a great day to visit an open-air Easter market where you can browse for artistically handcrafted Easter eggs, carved Easter decoration, and local arts and crafts. Stop by a German bakery for a special Easter treat like a sweet cake in the shape of a lamb. On Saturday evening, regions in the north of Germany will light Easter bonfires, chasing away the dark spirits of winter and welcoming the warmer seasons. Easter Sunday is the highlight of the holiday weekend. In the early morning, parents hide baskets filled with colored, hard boiled eggs, chocolate bunnies, sweets (like Kinder Surprise), and little presents for the kids. Many families attend an Easter service, followed by a traditional Easter lunch, lamb, potatoes, and fresh vegetables. This is another quiet family day. For some, it is marked with travel for returning from holiday. It is also a national holiday so expect offices and stores to be closed. Germans are lucky to enjoy a very long Easter weekend. From Good Friday to Easter Monday everything is closed from shops, bank, and offices. The exception is on Saturday when everything opens like normal, although beware that grocery stores, in particular, will be busy with people restocking. Trains and buses operate on a limited holiday schedule and are often crowded with people going on holiday or visiting family. School holidays also coincide with Easter holidays. They are usually two weeks around the Easter weekend. Expect loads of children and their families planning travel around this time. Keep in mind that hotels, museums, roadways, and trains are likely to be crowded, and make your reservations early.